The lunge is a powerful lower body exercise that is easy to learn and safe to do. Perfect for a home gym, you can do lunges with minimal equipment, or even your body weight. They are very effective in targeting your glutes and quads. Lunges also work your calves, hamstrings and core! Read on to discover the benefits of lunges and the answers to some FAQs. How many lunges should I do? What weight should I be using? Can I do lunges every day? Are lunges good for weight loss? Are lunges good for both males and females? Are lunges bad for your knees? Which exercise is better – lunges or squats? Can I get abs by doing lunges? How many variations of lunges are there? Are forward lunges or reverse lunges better? Can I do lunges whilst pregnant? Lunges are a unilateral exercise; they need you to use one side of your body at a time. The unilateral lunging movement aids in improving your coordination. It also helps train your proprioceptors. Proprioceptors respond to our body’s positions to help us balance. It’s an interesting topic – you can read about it, here. Having good balance is essential in life, for many reasons. Lunges are an excellent way to increase your stability and coordination skills. Our general hip mobility has suffered as a result of our modern-day lifestyles. We now spend a lot of time sitting for extended periods. Lunges are a great way to increase your hip mobility. This is due to the movement and stretch they demand from the hip flexors. Tight hip flexors and weak glutes are main culprits for hip pain and stiffness. Lunges both mobilize your hip flexors and strengthen your glutes. They are a great exercise for mobility maintenance and improvement. Lunges target some of the largest muscles in our body. These muscles need a lot of energy to function, and as a result, burn a lot of calories! Our quads, glutes and hamstrings generate a lot of output, and all three get hit by this exercise. Lunges are great addition to any workout geared at weight loss. Besides the calories burnt, lunges are a perfect exercise for developing lean mass. And the higher your levels of lean mass, the more calories you burn, in general! Core stability refers to our ability to control and maintain our spinal and pelvic positioning. Stability comes into play throughout movement. The lunge demands balance. This, in turn demands core engagement to help keep our torso upright during the exercise. Lunges are very effective in developing core strength and stability. They are a quicker way to abs than crunches will ever be! We need core strength and stability to be pain free and functional. This article goes into more detail about why core strength is so fundamental. Lunges are for you if you want to tone or develop your glutes, quads, and hamstrings! This exercise is great for tightening up the muscles in the legs and buttocks. The right combination of weight, repetitions and calorie intake will help you gain lean mass through the legs. Lunges are a favorite amongst bodybuilders and bikini babes, alike! Lunges are often performed with lower body strengthening in mind. One of the most popular benefits of lunges, one could say. This exercise has many variations, each of which you can load many ways. For example, barbell static lunges, dumbbell walking lunges, and Bulgarian lunges (split squat). Lunges can be done with heavy weight for fewer repetitions to gain lower body strength. As mentioned in benefit 6, lunges are a great weighted exercise. They also provide an opportunity to deload the spine. And you can do this whilst still using added weight or performing them with only your body weight. As the added weight can be in the form of dumbbells by your sides or a kettlebell in one hand, you need not load weight on your back or overhead. This allows people with specific back injuries to perform this exercise with minimal risk. If you do have a back injury, it’s always best to consult a professional before attempting lunges. A great feature of lunges is that they are a functional movement. This means they mimic everyday motion and movement patterns. Walking, running, and going up stairs all become much easier with conditioned legs. Lunges improve flexibility, mobility and strength. Performing this exercise will help you remain functional for longer throughout your life. 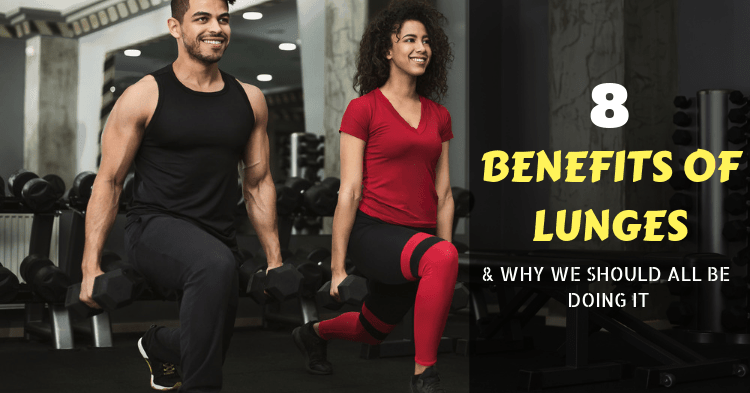 So now you know a bit about the awesome benefits of lunges! There’s plenty more to learn about this lower body power exercise. Below you will find the answers to some of the questions that are frequently asked. Yes! There are many variations of the lunge from beginner to advanced versions. If you’re a beginner, static (up and down in one place) lunges with the use of your bodyweight only would be best. Then progress to bodyweight walking lunges, which need more balance and strength. The number of repetitions you do would depend on your training goals. For weight loss, higher reps of 15+ on each leg are suitable. For hypertrophy, 10 to 15 reps. And for strength, less than 10 reps per side are best. The weight you would use when doing lunges would be specific to your training goals. If you’re doing 15+ repetitions, you wouldn’t want to be using the heaviest weight you can find. If you were doing 8 repetitions on each leg, you could afford to load it up a bit more. The key factor with weight is to not use more than you can manage. Form first! Depending on what kind of lunges you are doing and how weighted they are, you could get away with doing them every day. But, for best results, do your lunges on a maximum of two days per week to allow for ample recovery. If you are doing many sets of lunges throughout your training week, try to perform different variations. By doing this you can hit your muscles differently and play around with the intensity. Lunges need some of the biggest muscles in our body to work. The demand of the exercise plus the size of the muscles at work results in a greater calorie burn than other exercises, for example, bicep curls. When training for weight loss, your aim should be to burn lots of calories, build lean mass, and speed up your metabolism. Lunges are the perfect exercise for all three and should be in your weight loss workout regime. Lunges are great for both males and females. The way you tackle your lunges will determine the results they provide. For women who fear getting “too bulky”, fear not! This exercise will only bulk up your legs if done using lots of resistance whilst consuming a calorie surplus diet. And for those who are looking for serious strength and size, lunges are for you too! If you’re interested in learning more about the training methods required for gains, weight loss and strength, you can read about it, here. Lunges themselves are not bad for your knees. However, there are a range of contributing factors. Incorrect technique, tight quads/ITB band, ankle instability, or a lack of core strength can all contribute to feeling pain in the knees whilst doing any lower body exercises. Make sure to always start slowly if you’re a beginner and do the version of the lunge that is suitable to your level of fitness and conditioning. Squats and lunges are a different movement and cannot be compared in this way. Both exercises have their benefits and a solid lower body regime would consist of both. Lunges may be better than squats for a certain population, and vice versa. But it all comes down to the individual. Scientifically speaking, they target your muscles differently, and require a different force and movement pattern. Thus, one is not inferior or superior to the other. As the old saying goes, “abs are made in the kitchen!”. The sad truth about abs, is they are unfortunately made in the kitchen. No amount of any exercise is going to make them appear. It’s all about body fat! But lunges are a fantastic exercise for building core strength and stability. They will contribute to the strengthening and toning of your mid-section in conjunction with other exercises and a good diet! Static lunges, alternating lunges, reverse lunges, plyometric lunges, walking lunges, runners’ lunges, Bulgarian lunges, pulse lunges, lunge hold, kettlebell lunge and clean…to name a few! Here’s a good article on variations of the lunge. Whilst they use the same muscles, these two variations of the lunge load through the body in a different way. Neither one is better, though there is a ‘safer’ option. Reverse lunges are the safer of the two. This is because it’s easier to keep your knee aligned with your ankle due to the positioning of your body. This version also provides better stability through your stationary foot. Improper technique with forward lunges can create pain through the knee. This is due to incorrect alignment of the knee, and the instability created when shifting weight. It is easier to get wrong. Lunges are safe to do whilst pregnant. But, as all pregnancies are different, it’s best to consult your doctor before doing any workout regime or adding any exercises. As you can see, lunges are a dynamic exercise that provide room for endless progression! There is a version of the lunge for every fitness level, and a place for the lunge in (almost) everyone’s workout plan. Technique is key to getting the greatest benefit out of them and remaining injury free. You should never use more weight than you can manage. And make sure you pick a repetition range that is right for your training goals. Let us know of any questions you have, or what your favorite variation of the lunge is in the comments section below!